What: This method involves extracting the AUDIO_TS and VIDEO_TS folders from the master DVD or directing your DVD authoring software to output into AUDIO_TS and VIDEO_TS folders instead of burning a master disc. Note: The Discribe software was not meant for authoring DVDs. You must use another software to burn a master DVD first. Make sure that disc plays and the menus work on all systems. You may also copy a master DVD using the Copy Disc job. However, the following is the the recommended method. Recommend for: This method is especially useful if you are having compatibility problems with the formatting created by the DVD authoring software or with the media type of the master disc. 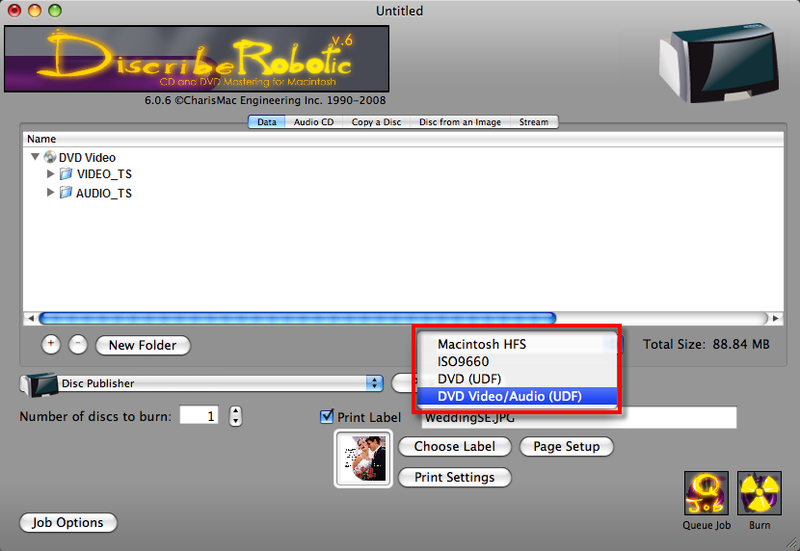 This method removes some potentially complicating variables from the DVD creation process. This method eliminates the need for a master disc. Error or incompatibilities can be introduced into your master by the drive burning the master, the disc the master is burned on or the software burning the master. Instead masters can be stored on a large hard drive. This allows you to burn additional copies at any time with out locating the master. Hard drive storage is more reliable over the long term since it is not susceptible to scratching like a master disc. The Knowledgebase article What is the best way to copy/create a DVD has extensive information on this topic. 1. Insert the DVD into a drive in your Mac. Open the DVD when it appears on your desktop (Ctrl + Click - choose Open from the menu). Copy the AUDIO_TS (optional) and VIDEO_TS folders from the master DVD to your hard drive. Or, use your DVD publishing software to create an output format in AUDIO_TS and VIDEO_TS folders. A VIDEO_TS folder must be at the root of any DVD. Inside the VIDEO_TS folder are specific DVD files that are created by your authoring software. 2. Select Data from the job menu bar. Drag and drop the AUDIO_TS and VIDEO_TS files to the data window to add them to your DVD. 3. Change the data type to DVD Video/Audio (UDF). 4. The remaining steps are the same as steps 2 - 6 of the Data job.